I’m in training for the week, and although it’s only 15 minutes from home, the hours are long and they put us up in a hotel right alongside I-225. 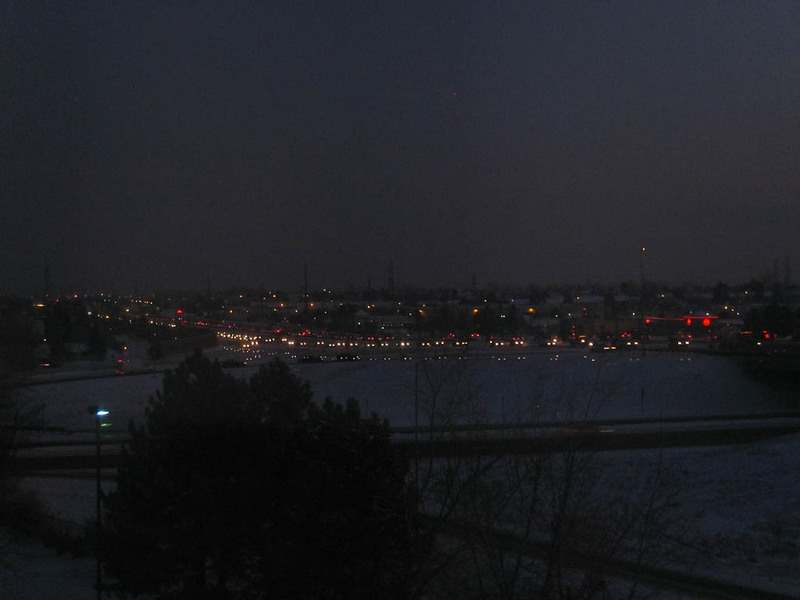 As I’m sure you all know, I-225 is a disaster and can have traffic jams at 4 in the morning in the summer. Last night came with snow and subzero temperatures, so 225 was sure to be in terrible shape. Not at all to my surprise, this is what I saw when I rolled out of bed at 6:45 this morning. Traffic was at a crawl. It was cold, dark, and early. And all I had to do was throw on some clothes and head downstairs to breakfast. i’m jealous. i had to drive cross-state in that mess (it was worse for me the day before though) and almost died more times than i would like to count. people in VW beetles should not try to fly onto 25, cut me off, and then speed off…because they end up meeting the concrete median and almost destroying my car (and others) a few times while they bounce around. yeesh.